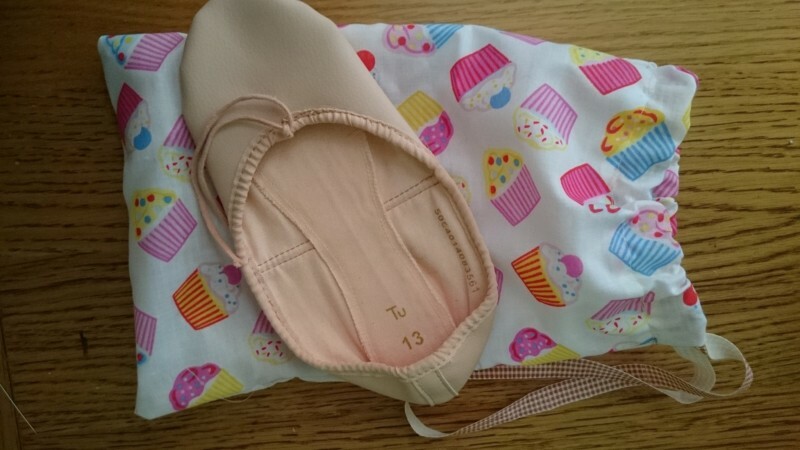 This morning I managed to make a ballet shoe bag, in-between all the other jobs that were crying out to be achieved! I’ve had the cupcake fabric laying around for a few years now as it wasn’t quite big enough to make anything else with a small bag was perfect so voila! I sewed down both long ends and then folded the top opening over to create a loop for the ribbon to be posted through. The only tricky bit was getting the ribbon through the hole, this is always the part that manages to annoy me! I used a pen to help guide the ribbon through. I finished the ribbon off by hand sewing the ends together (by that point my sewing machine had jammed again!) Once the ribbon is sewn and a loop has been made you can pull the bag shut. All I need to do now is sew the straps on the shoes and the rest of the jobs that are shouting at me! I’m working from home today with a poorly 2 year old and it’s a juggling act! I’m quite chuffed with the finished product and I hope my daughter will be as well!